Here is a transcript of the recording. Hear again the words of St. Paul. “The time of my departure has come. I have fought the good fight. I have finished the race. I have kept the faith. Henceforth there is laid up for me the crown of righteousness, which the Lord, the righteous judge, will award to me on that day, and not only to me but also to all who have loved his appearing” (2 Timothy 4:6b-8). May the words of my mouth and the meditations of our hearts, be always acceptable in your sight, O Lord, our strength and our Redeemer. Amen. My name is Andy Jones. 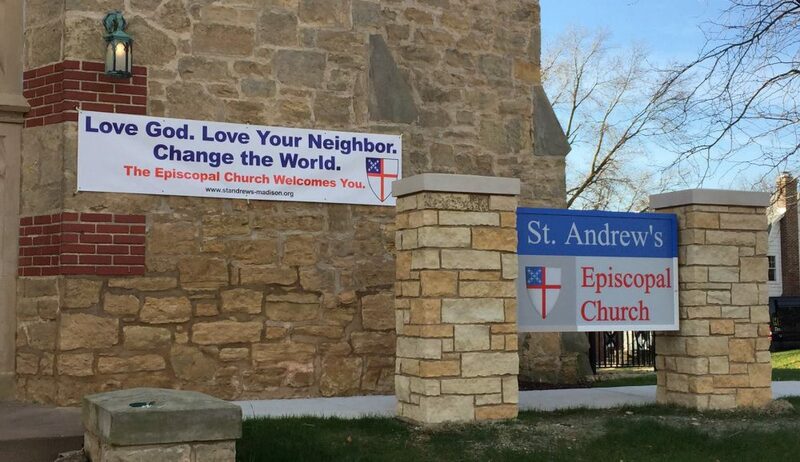 I am the rector of St. Andrew’s Episcopal Church here in Madison, and it is a great honor and a privilege to be standing before you all today in this moment. Twelve years ago, when I came to Madison, a first-time Rector, much further west than I had ever been in my life, a Marylander born and raised, it was also my honor and privilege to find Susan Miller in her office in the basement of St. Andrews; a room that she lovingly called the Hobbit Hole. Susan knew the histories of the people at St. Andrews. She knew their stories backward and forward. So many people had come to sit there in the hobbit hole with her, that she knew them, and they knew her, and they knew that she loved them. That’s why she knew their stories, because they were her family and she loved them. I’m guessing that’s why all of you are here today; because Susan knew you, and you knew Susan and you know that she loves you. Susan’s smile, her sense of humor, her laugh, those twinkling eyes, her ability to listen completely and without distraction, to convey total authenticity, and to help you to know that she was completely present with you as long as you sat there with her… those were among her many gifts. Those were the things that have built this community, the community that’s here gathered around her once again. Since we started telling people at St. Andrews, a little over three weeks ago, that this moment was approaching, there has been a flood of stories. People have approached me in my office, in the Narthex, in the stairwell, in the parish hall at coffee hour, they told me those stories, they’ve told those stories to one another. I’ve heard them being shared. I heard more of those stories being told at the St. Francis House board meeting this past week. St. Francis House Episcopal Student Center where Bill and Susan met and were married, and everyone there knew and loved Susan, and knows that Susan loves them. Now there’s lots of rich material from which to draw stories about Susan: sixteen years at Holy Name Seminary, her work with Renaissance Learning, her work as Archdeacon of the diocese and Director of the Deacon Formation Program; having served at St. Andrew’s, Grace, and St. Dunstan’s, Susan touched so many of us and there are so, so many stories. But there’s a common thread that ran through the stories that I heard. There was something that tied them together. And that was Susan’s love. All of the stories that I’ve heard about Susan have indicated Susan’s deep and abiding love. Susan didn’t just exercise that great gift in the church and with folks like all of us who find ourselves in places like this on Sunday morning. Bill told me this last week that Susan would go to the grocery store and complete strangers would know that she loved them. Children in grocery carts would be the recipients of her love, and joy, and praise, and her delight and adulation. Bill told me that Susan worked the grocery store like it was her parish. He also told me that here, in these last years of Susan’s life as the terrible disease that took her from us robbed her of so many of her gifts, that love remained. And that she worked the Narthex in this building like it was her parish, greeting people, welcoming them, drawing them together. If there are any words in this bulletin this morning that describe the Venerable Susan Miller, and I just have to tell you that she preferred venomous to venerable, it is the opening words of this hymn, “make me a channel of your peace.” Whether she was sitting there in the Hobbit Hole at St. Andrews, or working the narthex at the grocery store, Susan was serving as a channel of God’s peace; reconciling people one to another, reconciling people to God, reconciling people to themselves, and helping them to know that they are worthwhile, and intrinsically lovable, and valued beyond measure in God’s sight. That was Susan Miller’s gift, the ability to help each and every one of us know that, yes she loves us, but her love is a mix tension of God’s love. And that she lavished that gift upon us we couldn’t help but understand and embrace the truth that God does love each and every one of us. So as we stand to seeing this a.m. this morning I hope that you all will hear Susan’s voice and Susan’s prayer in these words. But I also hope that you will hear Susan’s charge to each and every one of us in these words. We’ll sing these words on Susan’s behalf, and in Susan’s memory, and Susan’s honor, but we’ll also sing them as a pledge to the one we knew and loved so well, the one whose love for us helped us to know God’s love in ways that were truly her gift. Make me, make all of us, a Channel of your piece. Let us reconcile ourselves and one another to God, following in the ways that Susan has taught formed us all. Whenever you encountered Susan, she always made you feel that you were the one person in the world she most wanted to see at that moment. What a gift!